In 2002 we formed The Flourishing Company to Help Change the Way People Experience Work. And we have. Working with leaders and teams within the US federal government, corporations, non-profits and the legal profession we have helped our clients improve their positivity and productivity. 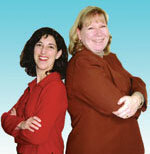 Miriam Grogan and Heather Bradley met in 2001 while preparing for their final coaching certification exam. The first time they worked together with a client they knew they had the opportunity to create something special. We have done so many varied and exciting things together – two books, coaching and training all over the country, online courses and more. And yet, when we sat down in early 2008 to look at what we each wanted professionally in the coming years, our answers were so different, it didn’t make sense to shoehorn them into one company going forward. After 5 ½ wonderful years of partnership, we decided to “un-partner” our formal working relationship. Miriam reinvigorated the company she formed before co-founding TFC, Stellar Coaching, and focuses on executive coaching, especially with large non-profit organizations and trade associations. Miriam can be reached at 202-223-0237 or miriam@stellarcoaching.com. Miriam continues with TFC as a Sr. Consultant and supports select clients, such as our friends at the Minority Corporate Counsel Association, the Internal Revenue Service and the Treasury Executive Institute.